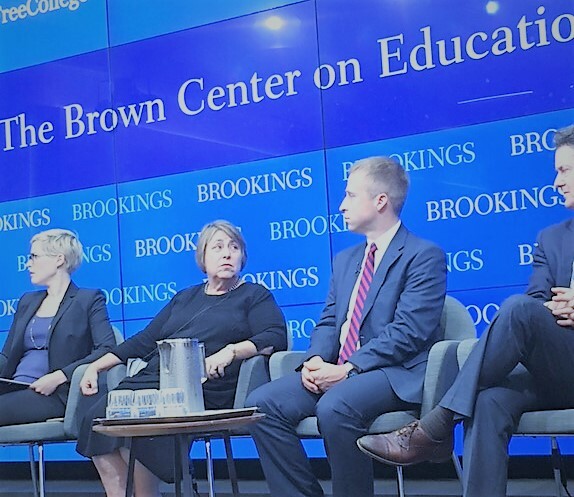 Today, the College Promise Campaign (CPC) joined a cross section of our nation's leaders at 'The Future of Free College' for the Brookings Institute. Dr. Martha Kanter, CPC's Executive Director, provided her expert opinions on the free college landscape, its momentum, and the critical need for quality research to inform Promise program policies that improve student and workforce outcomes. “At the College Promise Campaign, we firmly believe that research and data are essential to build quality Promise programs in communities and states, that not only help students attend college, but help them excel and succeed in college, career, and community. We believe that sharing our perspectives on the future of free college with scholars, policymakers, and practitioners is necessary to advance a meaningful future for students across the nation,” said Dr. Kanter in her remarks on the “Free College” panel. Since its formation in 2015, the College Promise Campaign has worked to increase broad public support for College Promise programs. The discussion today follows the release of a nearly decade-long randomized control trial study of a free college program in Milwaukee, Wisconsin by Dr. Doug Harris, Professor of Economics at Tulane University and a non-resident Senior Fellow at the Brown Center on Education at the Brookings Institution. On the panel, Dr. Kanter was joined by Dr. Harris; Dr. Beth Akers, Senior Fellow at the Manhattan Institute; Dr. Zakiya Smith Ellis, Secretary of Higher Education from the State of New Jersey; Dr. Robert Kelchen, Assistant Professor of Higher Education at Seton Hall University; and Dr. Michael Hansen, Senior Fellow and Director of the Brown Center on Education who moderated the panel. This discussion of “The Future of Free College” comes just after the College Promise Campaign’s celebrated its third anniversary. Over the years, the College Promise movement has grown from fifty programs in 2015 to more than 200 across the country in 2018, and from Tennessee to 23 states, with eleven more states enacting College Promise legislation or executive actions this year alone. As the College Promise movement has grown, the Strada Education Network has enabled the Campaign to establish the College Promise Research Network (CPRN), made up of dedicated scholars and researchers committed to informing Promise programs through high-quality data and research. “CPC continues to advocate for the use of data and research to promote a college-going culture, post-secondary student access and success, and employment readiness and advancement. Across the nation, we are witnessing innovative Promise designs to lift regional expectations in whole communities that education beyond high school is essential,” said Rosye Cloud, CPC's VP of Innovation and Strategy. The College Promise Campaign is a nonpartisan, nonprofit higher education initiative that builds widespread support for funding a quality postsecondary education for all hardworking students. In the 21st century, a high school diploma is no longer enough to lead Americans to a good job and decent quality of life. CPC is an initiative of Civic Nation, a 501(c)(3) organized exclusively for charitable and educational purposes. Learn more about the College Promise Campaign by visiting our website at collegepromise.org. Follow the movement on twitter @college_promise.